← A bus station is where a bus stops. A train station is where a train stops. My desk is a work station. Well, it is that time of year; family and friends gather to celebrate light and life and miracles. Traditions abound in December, not the least of which in my case is an annual family gathering, and the obligatory Yankee Swap of gifts. My family is competitive; we follow professional, college level, secondary and even elementary sports. Rivalries reign at the card table, during game night, over dinner. So, it was no surprise that when we decided to add a Yankee Swap to our annual party, there will be blood became the unofficial motto. Not for the feint of heart, you have to buck up to join in. Toenail clippers and a Snookie doll? Ha! Here you go, have a chemical toilet for your camping or power outage enjoyment. If one more Mr. Wonderful doll rears his ugly plastic head and grating obsequious voice, I think I will scream. 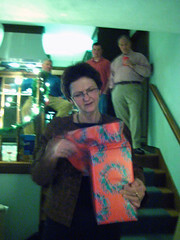 Taking a step back, I recently discovered the origins of the Yankee Swap. During the U.S. Civil War, the Yankees and Confederates would exchange prisoners during the holiday season to elevate the mood, a sort of atonement. The exchange rate at one point was as follows: one general for every 60 enlisted men, a colonel for 15, a lieutenant for 4, and a sergeant for 2. If we could follow suit at next year’s gathering, I suggest my own version of an exchange rate: one small appliance for four Snookie dolls and a Dunkin Donuts gift card, two homemade jams, soups, or breads for three gently used novels or videos, three bottles of any kind of liqueur for any other kind of liqueur. In fact, maybe I will come up with an exchange rate for my freelance work. One 500 word essay for a 12 pack of Shipyard ale, one article on solar power for a fifth of Kahlua, one blog entry for a bottle of Chianti…you get the picture. I’ll be home all week, stop by with your exchange anytime. This entry was posted in general and tagged blog, Chianti, Christmas, creative writing, Dunkin Donuts, Yankee Swap. Bookmark the permalink. Great article. The Yankee Swap is always a hightlight of the family get together. Although the two “cookie swap” get-togethers I attended this year were also lots of fun.